Yesterday, I had a fruit bowl full of pears that were just sitting starring at me…. 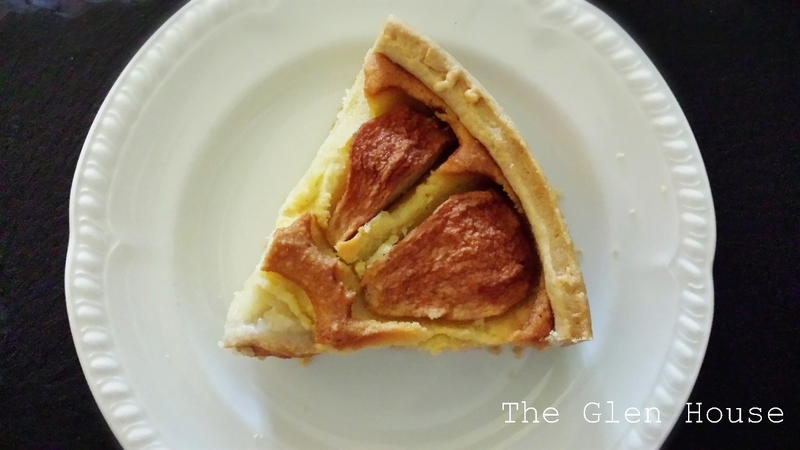 I came across Lorraine Pascale’s Pear, almond & amaretto tart. 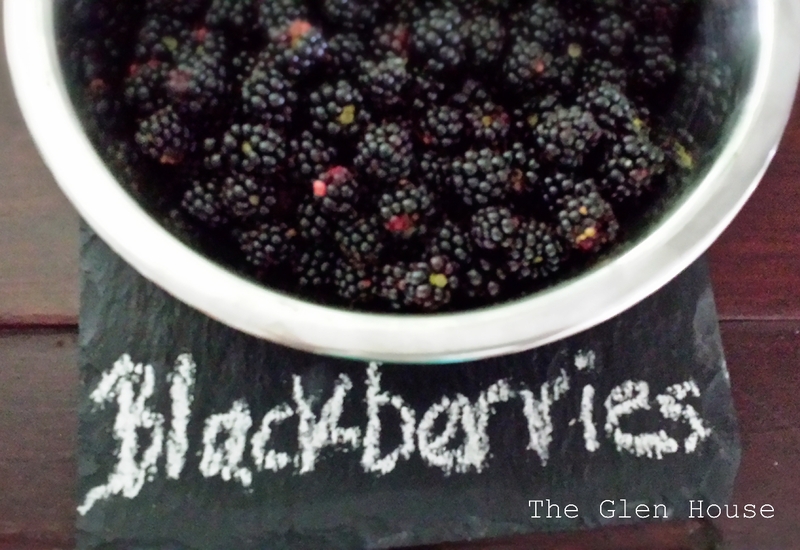 It sounded perfect, I fancied another tart in the kitchen after the delicious blackberry jam and apple tart last week! 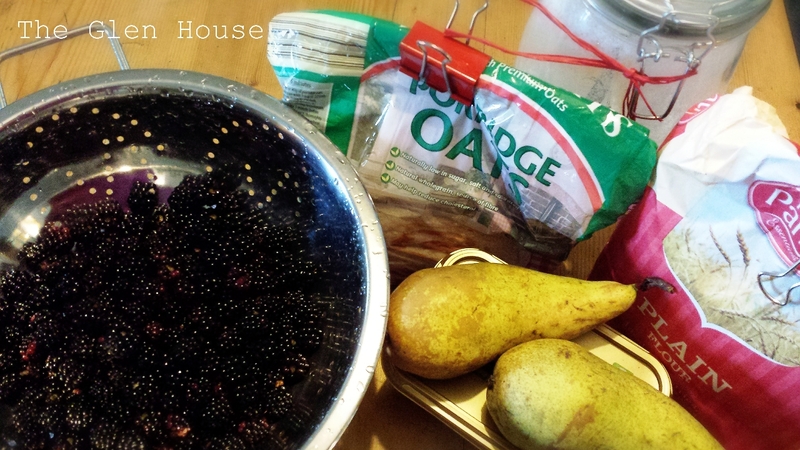 “This sweet treat is the perfect autumn dessert…. If you can’t find any ripe pears, tinned ones are just as nice” she states. I have changed her recipe slightly (I didn’t use a long tart tin) and I didn’t make the cream that she suggested, otherwise this is all her work! Unravel the ready-rolled pastry and use it to line a flan tin. Roll it out a touch more, if necessary, to fit in perfectly. If using a block of pastry, then roll out to just bigger than the tin on a floured surface and use in the same way. Either way, be really careful to not stretch the pastry or pull it, as this will make it shrink in the tin when it bakes. Cut off the excess pastry with a sharp knife and then sit the tin on a baking sheet and pop in the fridge to harden up a bit while you prepare the filling. 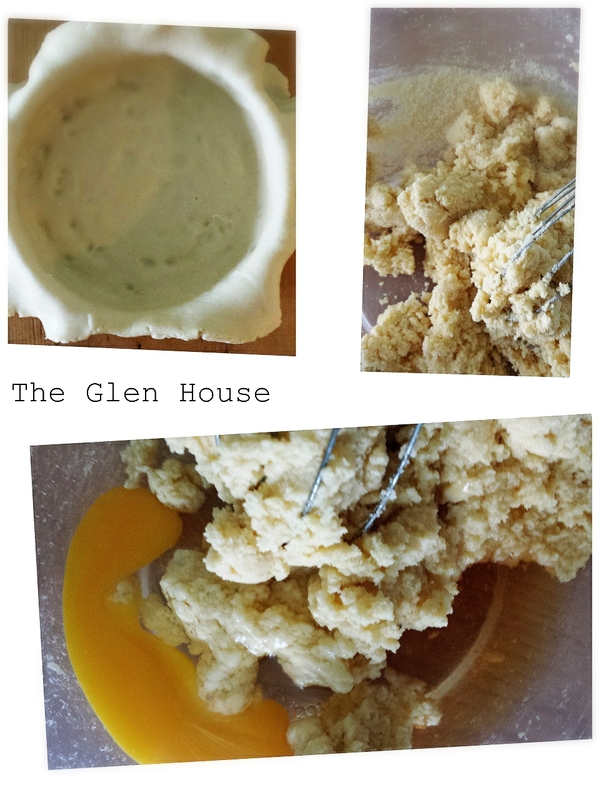 Mix the butter and sugar together in a medium bowl either by hand or using a hand-held electric whisk (or in a freestanding electric mixer) until it is really soft and well combined. Then beat in the ground almonds and plain flour. Crack the egg in, add the amaretto liqueur, and then beat it hard so everything is combined. Remove the lined tin from the fridge and add the almond filling, spreading it out evenly so it is nice and smooth on top. Drain the tinned pears well in a colander and then on kitchen paper. Or peel, halve and decore the fresh pears, if using. 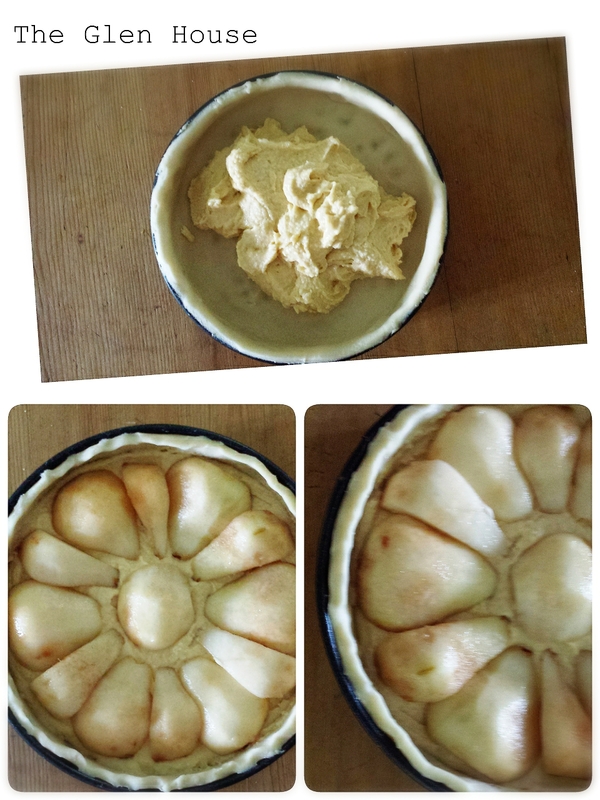 Arrange the pear halves, cut side down, in the almond filling. Bake in the oven for 35-45 minutes or until the filling is nicely puffed up and golden. Check the tart is cooked. 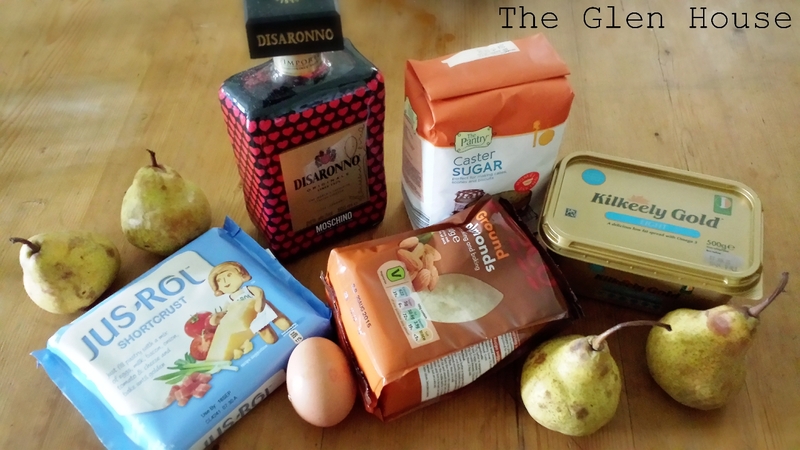 The pastry will be crisp and golden and the almond filling should have puffed up a little around the pears and be golden brown and spongy. Stick a skewer or point of a sharp knife into the centre of the filling to check it is done. It will be just a little damp from the moisture of the pears, but shouldn’t be really wet like the original raw mixture. Once cooked, remove from the oven and leave to cool in the tin for a few minutes before carefully removing it from the tin. Then simply slide the tart off the base onto plate or board. I have to admit that I ought to have rolled the pastry out more; the base seemed thin and crispy, but the sides were far to thick. 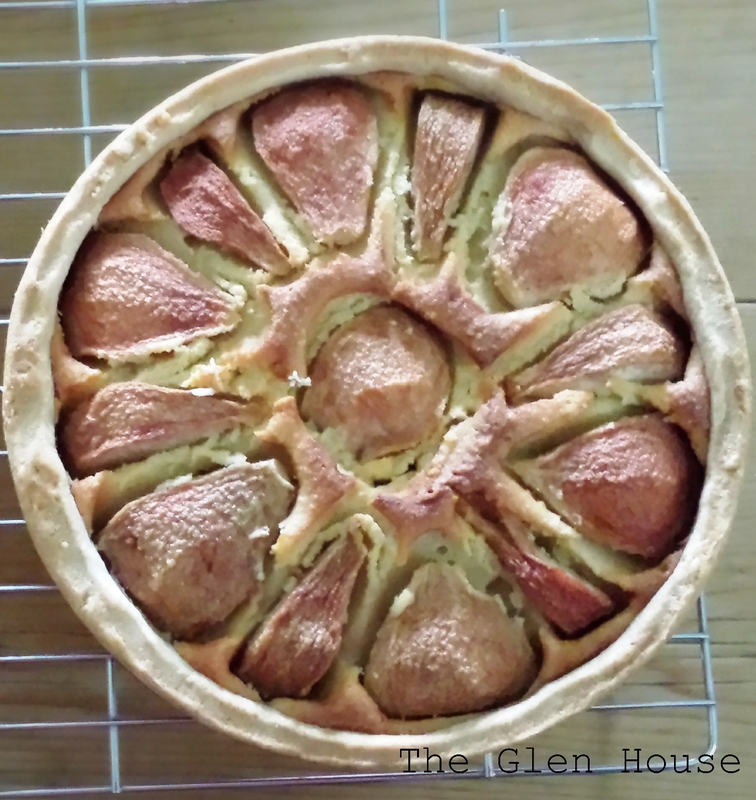 I also should have dusted the tart with icing sugar before I took the photographs! 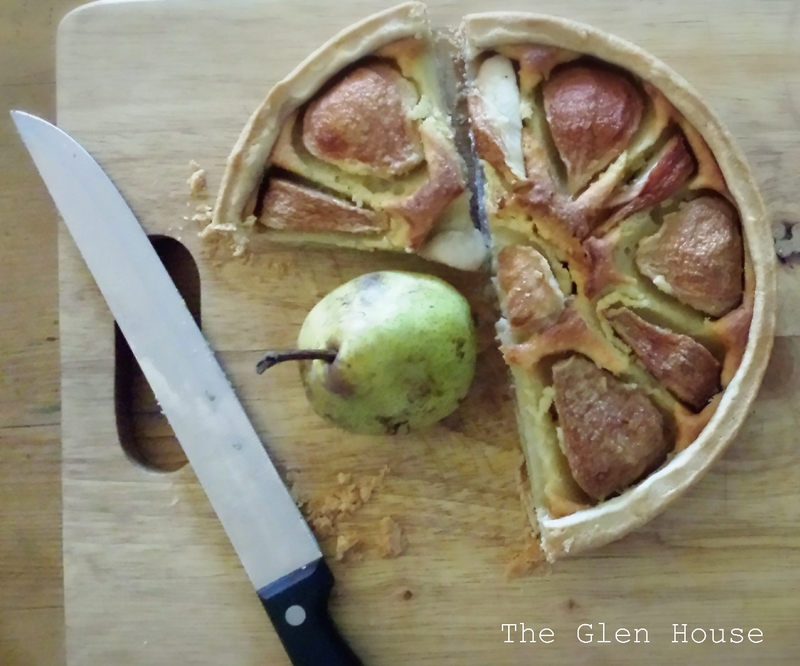 This tart marks our 1st anniversary in The Glen House, I can’t believe we’ve been here a year! Maybe this coming year we’ll sort out the box room? Ahem!!! If anyone needs me, I’ll be counting out ALL the candles for Dr Doolittle’s birthday cake!!! 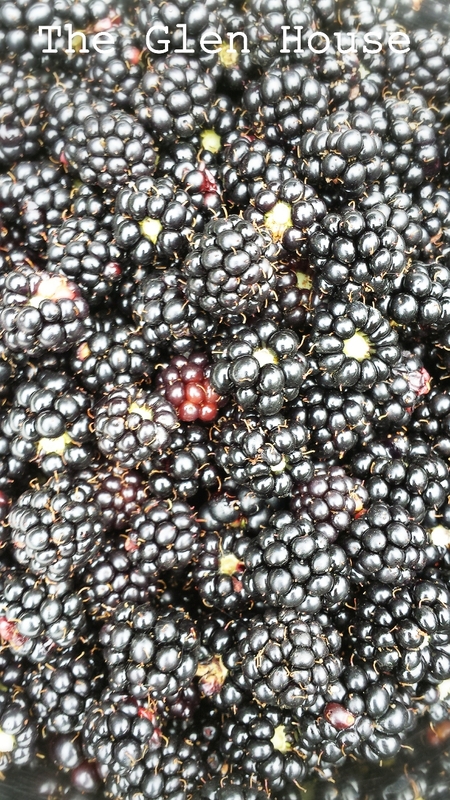 It’s that time of year again, the time when beautiful little blackberries start popping up in abundance in Irish hedgerows. 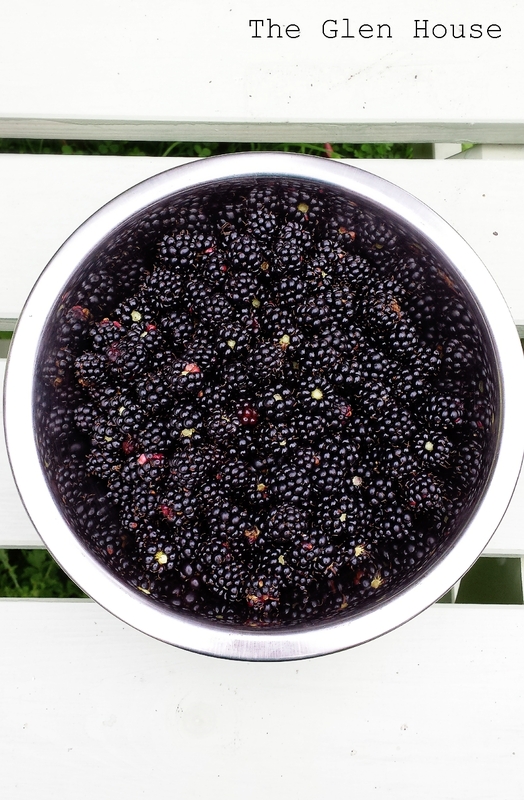 Luckily, they seem to be making a staggered appearance around The Glen House garden, giving us plenty of time to pick them. Just to note, we’re not picking them all, there are PLENTY left for the birds! 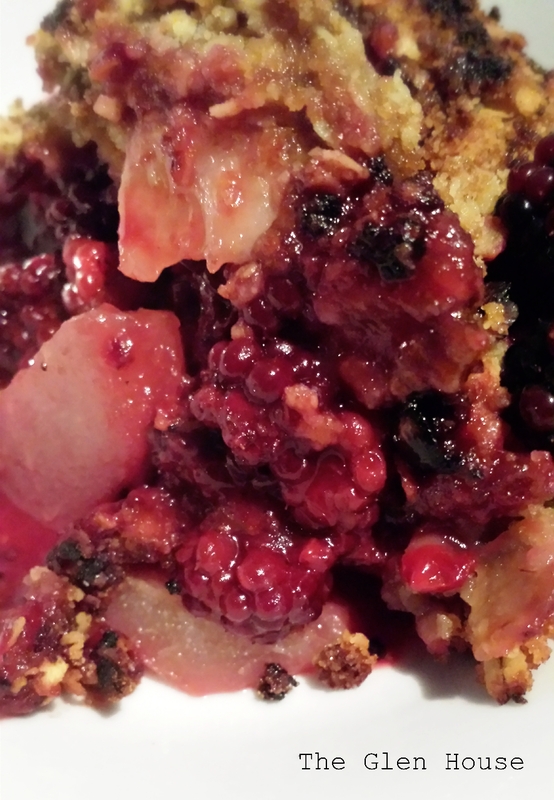 So this week I’ve decided to bring a blackberry and pear crumble to Angie’s place for Fiesta Friday. 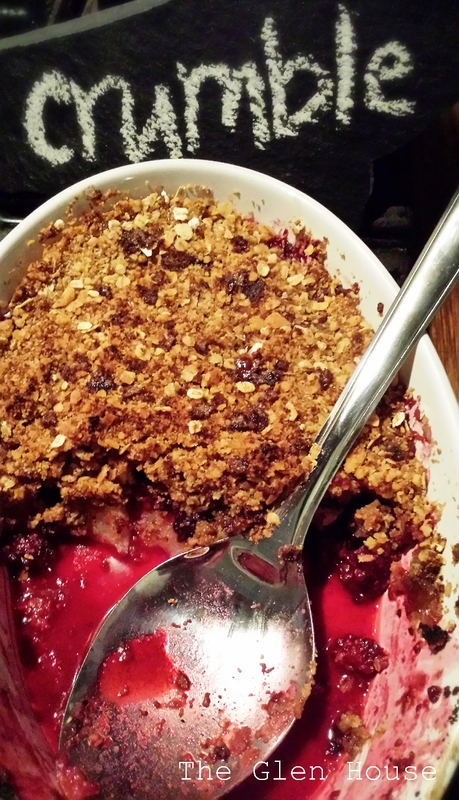 My favourite crumble recipe is from Rachel Allen’s book Bake! 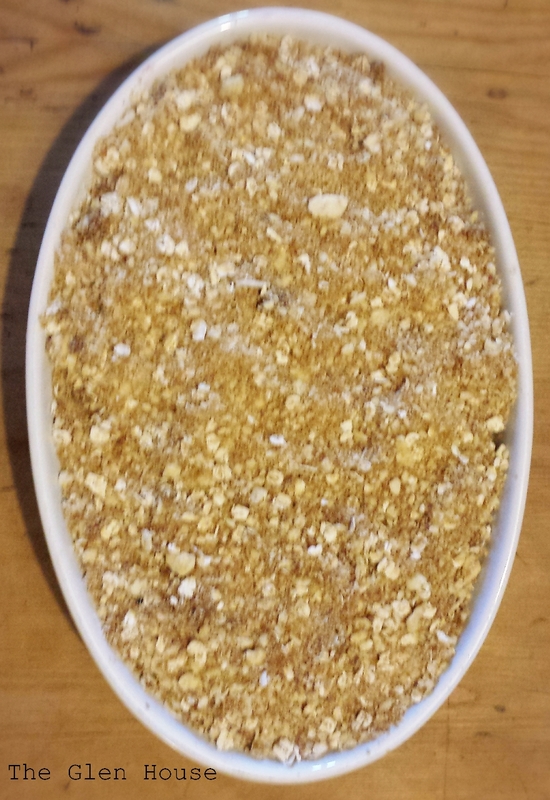 It adds oats to a traditional crumble mixture to give it a really crunchie texture. 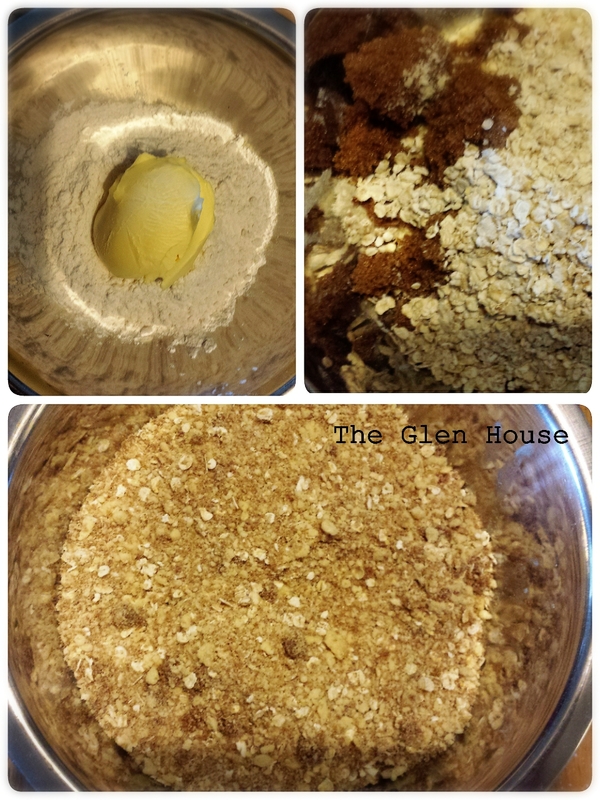 This is my version…..
Place the flour in a large bowl, add in the butter and using your fingertips rub it in until it resembles coarse bread crumbs. Then add in the sugar and oats and combine (I used a spoon, so that I wouldn’t warm the butter up). 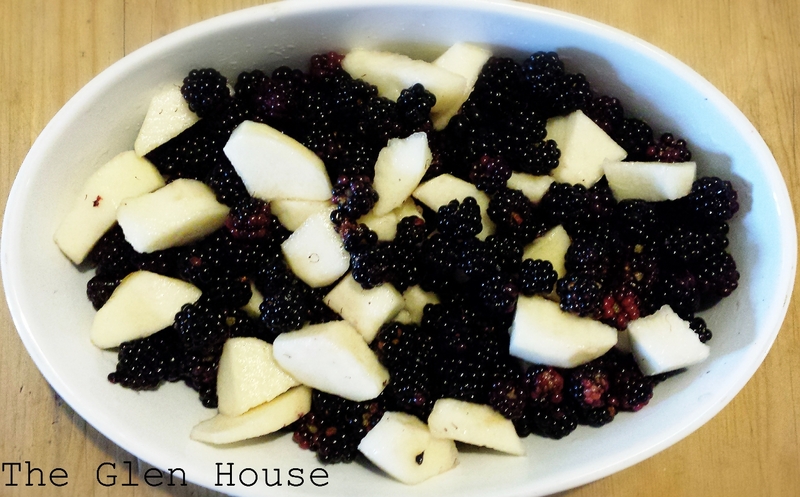 Lay the blackberries and chopped up pear in a 1 litre pie or oven dish, then sprinkle with the crumble mixture. Bake in a preheated oven at 180 degrees for 30-40 minutes until golden brown on top. 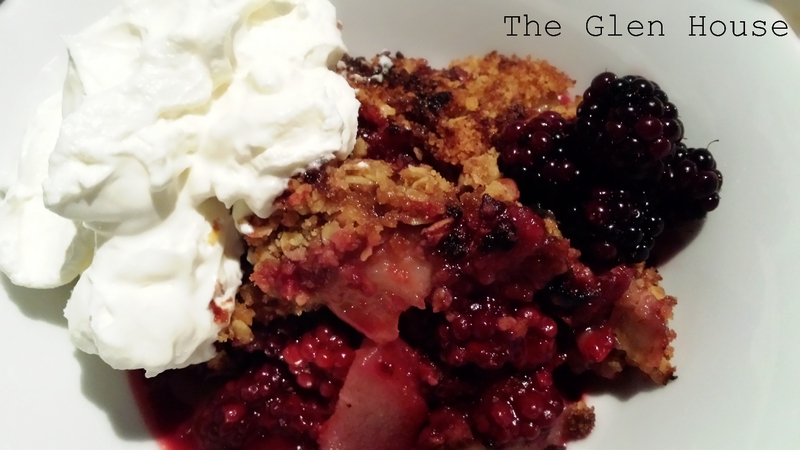 I served mine with greek yogurt, but custard or icecream would be just as yummy! I stumbled upon a poem by the wonderful Irish poet Seamus Heaney that sums up this time of year…. Leaving stains upon the tongue and lust for picking.